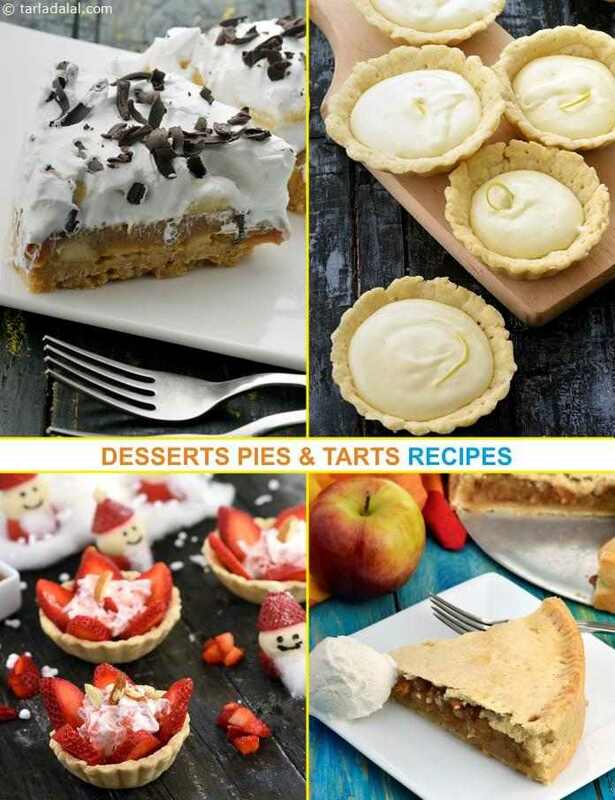 Pies and tarts are dainty-looking but elaborate desserts, where a plain flour base is topped with sweet fillings to create delicacies like the White Chocolate Pistachio Pie , Mango Cheese Pie , etc. Although the original methods are quite elaborate, we present those as well as quicker versions using crushed biscuit bases, etc. Delicious tarts made with walnut barfi topped with a creamy chocolate topping. An instant hit at tea parties. These delicious rich tarts will just melt in your mouth. Strawberry tart is a ravishing and luscious tea-time delicacy of dainty pastry tartlets filled with slices of fresh strawberries, honey and whipped cream, and garnished with almonds. When strawberries are not in season, you can use fresh mangoes to make mango tarts instead. Light and fluffy lemon pie is set on a crunchy chocolate crust. Garnish this pie with layer of sweetened cream and a slice of lemon for an added effect. You will love this, cool lemon filling. Strawberries and cream with a difference. Try variations by filling the puffs with ice - cream and fruit combinations. Your guests will love these beautiful baskets filled with fruit and ice-cream.